I was running home late after a busy day at work and had planned to throw together a steak marinade recipe using the leftover Barbera d’Asti I reviewed earlier this month, but my boyfriend beat me to it. In fact, he’s the one who first introduced me to using wine as a marinade for steak, a hand-me-down trick from his mom. We’ve used different kinds of wines since for varying recipes. The time prior to this, I believe I mixed some Torrontes, olive oil and zahatar I bought at Spice Station, a perfect little spice shop in my neighborhood. We’ve also tried Cabernet Sauvignon, Zinfandel, Malbec and other reds and have largely had successful outcomes. 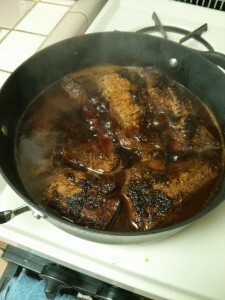 We typically let the steak soak and then grill to medium-rear, but this time around the steak was coated in a spice rub, heated in a frying pan and then braised in the leftover Barbera. Rub the spice mixture and two tablespoons of olive oil into the steaks–we used tri-tip, but the recipe calls for flatiron–and then add the remaining oil to the frying pan. Sear both sides of the steak for two to three minutes, making sure the inside is still rear. Remove steaks with tongs and add the wine to the pan, scraping up the goodies that have burned to the bottom. Replace the steaks in the mixture and cook on low for about five minutes. Check steaks with a thermometer to get your desired level of tenderness. 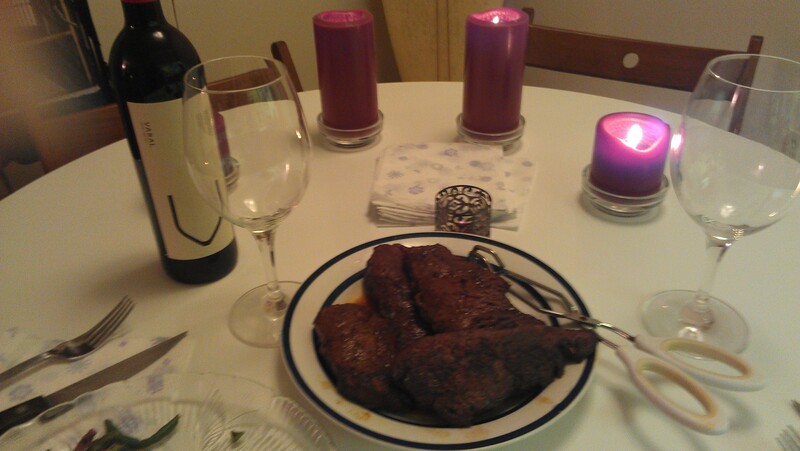 The steaks were delicious, spicy and juicy. We enjoyed them with a nice Potuguese red blend I bought at a wine store in Berkeley when I visited a friend. I plan to review it soon, promise! Check out my Facebook page for a sneak peak of my thoughts. To read my blog post about the Barbera d’Asti, click here.